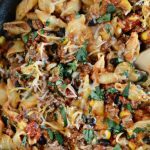 Creamy One-Pot Shells and Beef is an easy pasta dish that is cooked in a tomato cream sauce and is ready in just 30 minutes. It’s easy to make, easy to clean and kid approved! Yes, it’s me again with another easy 30 minute one-pot dinner for ya. 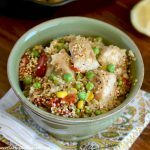 I seem to be on roll with these lately, but the end of the school year is always super busy, and these quick and easy meals are pretty much necessary for our survival. And today, I was out all day chaperoning a gaggle of giggling girls– my own included — on a school field trip. Actually, as field trips go, it wasn’t bad at all — I’ve seen a lot worse. But by the end of the day, my energy level was practically down to zero, and cooking dinner was the last thing on my mind. I even forgot that I had asked the Hubs to pick up some fresh ground beef on his way home. That’s what’s so great about one dish meals. You don’t need to put a lot of time or effort into dinner, but everyone is fed and happy, and you feel like Super Mom, even when you’re exhausted. My family loves pasta, but I wanted to try something a little bit different this time, so I made a creamy tomato sauce instead of the usual red sauce. Basically, I cooked the beef and pasta, added some tomato sauce and, then I added a little cream at the end. Easy peasy. I used medium shells this time, but you could use mini penne, bow ties or pretty much whatever you have on hand. You could make this even easier by using dried onions or garlic powder — it’s up to you. If I’m really in a rush, I’ll do this, but I usually enjoy the chopping process. It actually relaxes me. Or sometimes, I’ll just ask the Hubs or one of my older kids to help! What really saves time is having chopped onions waiting in the freezer. If I cut a whole onion, I’ll try to freeze half for later, and eventually, I’ll have a nice stash of onions when I need them! If you want to make shells and beef in the Instant Pot, here’s the recipe. It’s even easier! 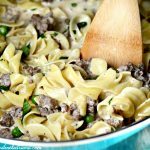 I’m happy to report that the whole family loved this creamy one-pot shells and beef. I served a simple salad on the side, which was just enough to make dinner complete. And after dinner was over, I went and put my feet up for the rest of the evening! I love one-pot meals! This looks so comforting! One-pot meals are the best! Easy to make and easy cleanup! Love those large shells – creamy and dreamy comfort food! Thanks, Melanie. The shells are perfect for holding in the sauce! This looks so good! I think I will try this maybe with a beef substitute as we love beef but are tying to cut back. Great Pictures also. Thanks so much, Susan. I would say whatever works best! I absolutely loved this post! Sunday is the day to innovate at lunch (since I don’t have any time for it during the week). Why not try this simple, fast and delicious recipe? Thanks for sharing! This one pot dish looks fabulous! Love all that creamy goodness! We would totally be in love with this for dinner. I love easy 30 minute meals like this. I need dinner ideas like this to make after working at the office all day! Thanks, Angie. I honestly don’t know what I would do without one-pot meals! Wow, this sounds amazing! 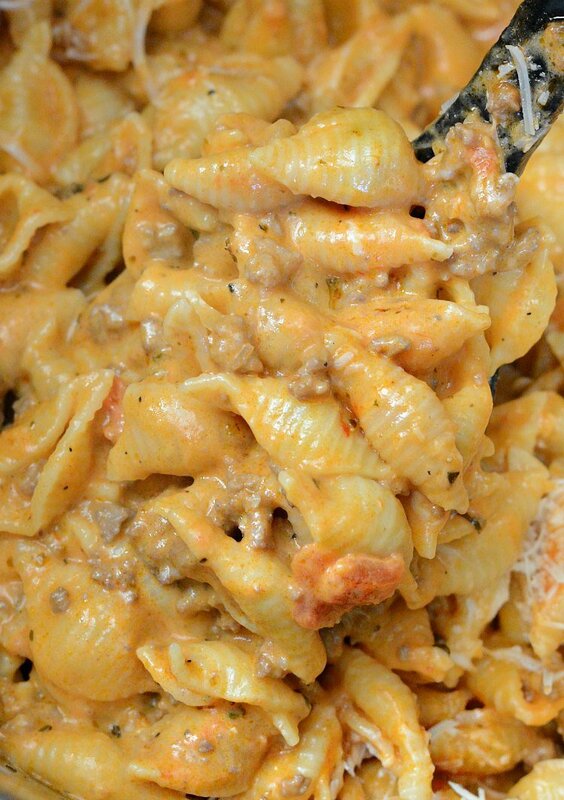 I don’t have shells at home, but I do have elbow macaroni and I’m definitely going to try this soon! Thanks for letting me know, Meryl I’m happy to hear that! Just wanted to take a moment to let you know that I made this last night, and we really enjoyed it! Much better than a meal out of a box! I used penne pasta since I didn’t have any shells. The half & half gave it that extra special creamy taste that everyone loves. Thanks for the recipe; I know it will be on my table again! Is the Italian seasoning mix the salad dressing one or dried herb seasoning? Sounds delicious!! Hi, Cheree. It’s just a mix of dried herbs that you can buy from any grocery store. I don’t see anywhere that you talk about draining the grease from the beef. Doesn’t this make it oily? Hi Sue. 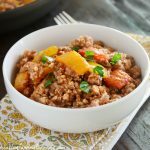 I use extra lean beef for one pot meals just so that I don’t have to drain the fat. If you use beef with a higher fat content, I would definitely drain the excess fat. I made this tonight and it was a winner! I was a bit skeptical of adding the water and cooking the pasta with everything else, but it worked perfectly. Even my picky eater liked it…it’s going in the regular rotation. That’s wonderful, Annette! I’m happy to hear that your family liked it! The picture shows some green in the dish. Is that fresh basil or spinach? Made this meal. So simple and yummy. I added chopped asparagus and a pinch of chili flake. oh and I used elbow noodles, because that is what I had on hand. thank you. Awesome. Was looking for quick easy recipe for ground beef where I had all ingredients on hand. Who knew it would turn into my new go-to!!! Thanks! Thanks, Lorraine. This is one of our favorite dinners, too!